In the last two blogs I have been discussing values in sports. We can’t talk about value based sport without talking about the value of RESPECT. No self-respecting blog about respect can start without referencing a line from Aretha Franklin’s song “Respect”. Of course, the question you know is coming…what does respect mean to me (you)? It is one of those loaded words that we believe we all understand. Yet it is not showing up all the time at our kids sporting events. But that is not where I want to focus for this blog. It is the back half of the sentence with the lyrics of Aretha’s song …”sock it to me, sock it to me, sock it to me” that demands attention. This is not to belabour how we have “socked it” to each other or what we so often hear about in the media – the fight in the stands, the official that was beat up in the parking lot, the death threat to the coach, or the parent or coach who were banned from the arena for a year (and these are mild stories compared to some that we have all heard). This is about giving the person who has lost it (for lack of a better term), “A little respect, just a little bit, just a little bit”. And here is why. When people are in the heat of an argument or a heated discussion as an example, they are demanding respect from the other person. It may show up in the discussion as the need to be right and arguing their point. I think something we can all relate to at some point and time in our lives. At the deepest level, the reason why we are demanding respect from others is that we are not giving ourselves respect. If we can’t respect ourselves, then we look outward to find respect or worse yet, demand the respect from others. I need you to stop and noodle this one for a moment because it does put a twist on things. Look at it this way. 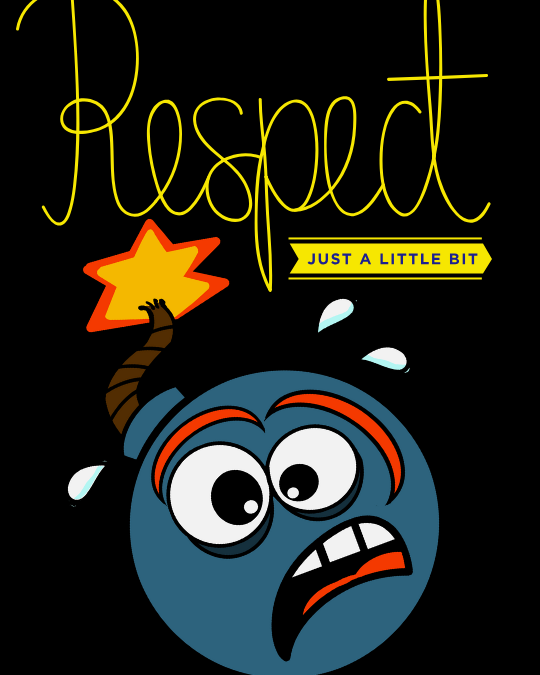 The next time you are at your athlete’s game or event, and you see someone not behaving with respect (however you define it), picture that person in a desperate plea looking for a little respect. Use the analogy of a person is drowning. They will grasp at anything, even you, who is trying to save them as they fight to get air. They don’t mean to pull you down. They are running on full on fear. Life-guarding 101 states, don’t go in after them, throw them a rope that they can grab onto or a flotation device. Same holds true for someone who is yelling, arguing, or fighting at their kids sporting event. They are drowning in lack of self respect and we need to throw them some respect. Just a little bit, just a little bit of respect with compassion. Don’t jump in! They just need a little something to grab on to and they will be able to save themselves.